Kolymbari beach is approximately 23km west of Chania town, on the old National road Chania-Kissamos. It is the westernmost point of Chania bay. Umbrellas and sunbeds, showers, lifeguard, water sports, parking, cafe, snack, tavernas, restaurants, accommodation, mini markets. *Kolymbari beach is mainly sandy with big pebbles at parts. 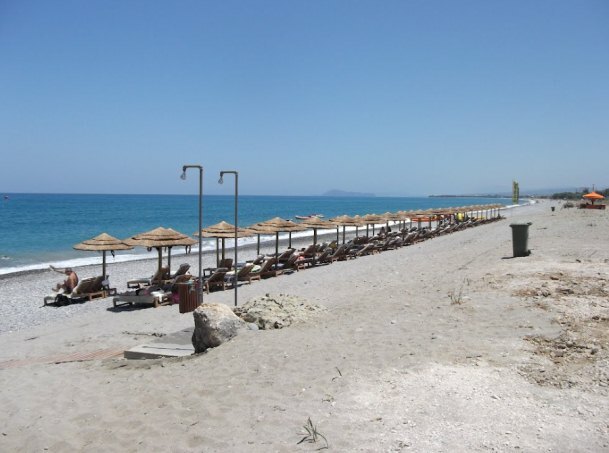 ** Like all beaches on the north west coast of Crete, it is affected by the winds which blow during July and August and are widely known as “meltemia”. During these days attention is required, due to dangerous sea currents and large waves. From the beach you can see the Thodorou islet, a preservation area of the Cretan wild goat widely known as Kri-kri. Kolymbari beach is easily accessible from Chania and Kastelli by public buses or rented cars and motorbikes. The beach is near the junction with the new National road Chanion-Kissamou.